Johannesburg, November 21 : South African captain AB de Villiers has expressed that he is willing to bat down the order in order to ensure that his team wouldn't lose in case of a batting collapse. De Villiers admitted that having enough experience, he would like to push himself down to make sure that they would have a good chance of winning the game at the end. He further said that ideally they wouldn't like to have such situations but such plans could possibly save them from getting bowled out, Sport24 reported. Johannesburg, Aug 9 : Former South African wicketkeeper Mark Boucher has branded AB de Villiers as the best batsman in the world at the moment. Boucher, who is a former teammate of De Villiers, said that any time the batsman gets a 100, it is going to be difficult to stop South Africa from winning, and added that that is why he is the best batsmen in the world, in all formats of the game. A passionate conservationist, Boucher recently attended the announcement of the joint venture between the Castle Lager Boucher Legacy programme and the Blue Bulls, in an effort to bolster the fight against rhino poaching, Sport24 reported. Johannesburg: AB de Villiers dominated the Cricket South Africa Awards banquet by bagging four awards, including Cricketer of the Year 2014, here on Wednesday evening. De Villiers was also named Test Cricketer of the Year, was recognised by his peers as SA Players? 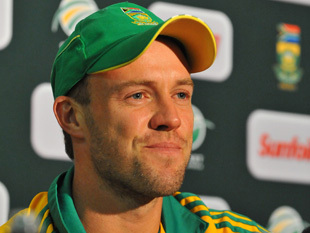 Player of the Year and by popular vote of the public, SA Fans` Cricketer of the Year. The only award for which De Villiers was nominated but did not win was the ODI Player of the Year which went to Quinton de Kock, who scored four centuries in the period under review including three in consecutive innings. Bangalore, May 5 - South African star Abraham Benjamin de Villiers smashed a brilliant 41-ball 89 not out (8x6, 4x4) to help Royal Challengers Bangalore beat Sunrisers Hyderabad by four wickets and a ball to spare in the IPL-7 match here Sunday. After Sunrisers, asked to bat first, made 155 for five, thanks to a 62-run partnership between skipper and opener Shikhar Dhawan (37, 36b, 4x4) and David Warner (61, 49b, 4x4, 3x6), de Villiers guided RCB to their third win in six outings with a memorable knock that underlined his status as one of the best T20 batsmen in world cricket. Johannesburg, Dec 25 : South African vice-captain AB de Villiers has said that the team will seek to arrest a dismal Durban run of four straight defeats at Kingsmead when they host India in the second and final test on Thursday, following their epic draw in Johannesburg. The hosts are at loss to explain their miserable run at one of the country's premier Test grounds, where they have not won since beating West Indies in 2008, while Australia, England, India and Sri Lanka have all enjoyed handsome triumphs in Durban over the world's top ranked Test team since then. Dubai, Dec 12 : South Africa captain AB de Villiers has regained the number one rank in the Reliance ICC Player Rankings for ODI batsmen as he moved up one place thanks to some brilliant performances in the three-match series against India which ended Wednesday. The latest rankings update were released Thursday, a day after the final match in the series was washed out to hand the home team a 2-0 series win. The series win resulted in a number of South Africa players making a move in the right direction in both the batting and bowling lists. Johannesburg, Dec. 5 : Proteas captain AB de Villiers has reportedly said that his team is by no means underdogs, as they prepare to bat it out against India, ranked the best ODI side in the world, at the Wanderers on Thursday. De Villiers said that on the home ground they have the skills to counter India, for whom it will be a different scenario playing in the South African conditions. According to Sports24, the Proteas, ranked fifth in the ODI rankings, are fresh off a 2-1 series loss to Pakistan, while India has two consecutive series victories over Australia and the West Indies. Johannesburg, Mar 1 : AB de Villiers has claimed constant squad rotation in South Africa''s limited-over squads is affecting their performance in the one-day and Twenty20 formats. De Villiers admitted that the Proteas are finding it difficult to match their global Test stature in Twenty20 cricket because of the limited amount of time they spend together and constant squad rotation in the short format, Sport24 reports. A strong performance by South Africa in tests and a decent performance in the first ODI had kept the South African team all upbeat until the Superman from India Sachin Tendulkar first dived to stop the all important boundary and then with an unbelievable knock of 200 not out that clinched the series win for India. The South Africans still have a lot of positives to take home from the series.